The air is thick with lilies. on a lake of reflected stars. the wine we could not finish. I have reached an age I doubt I’ll double. wisdom of a man they knew. a symbol of something diminished. hundreds of miles of thirst and disorientation. on the U.S. side of sand and desolation. for all its teeth, it is mostly made of air. Copyright 2008, Charles Rafferty. © This work is protected under the U.S. copyright laws. It may not be reproduced, reprinted, reused, or altered without the expressed written permission of the author. 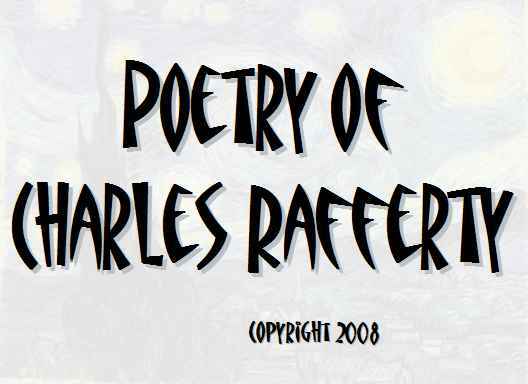 Charles Rafferty is the author of four full-length collections of poetry: The Man on the Tower (University of Arkansas Press), Where the Glories of April Lead (Mitki/Mitki Press), During the Beauty Shortage (M2 Press), and most recently A Less Fabulous Infinity (Louisiana Literature Press). He teaches at AlbertusMagnus College and in the MFA program at Western Connecticut State University. By day, he works as an editor for a technology consulting firm.